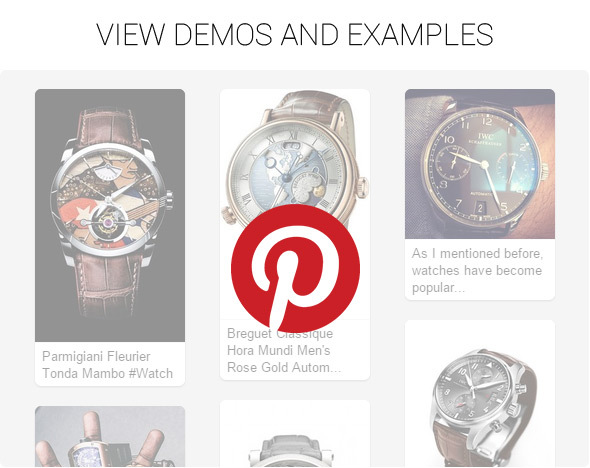 The only Pinterest plugin you will ever need! PinWorks+ WordPress Pinterest Gallery Widget allows adding pins to your wordpress website very fast, using Pinterest’s API for retrieving user pins and pins from a user’s specific board. 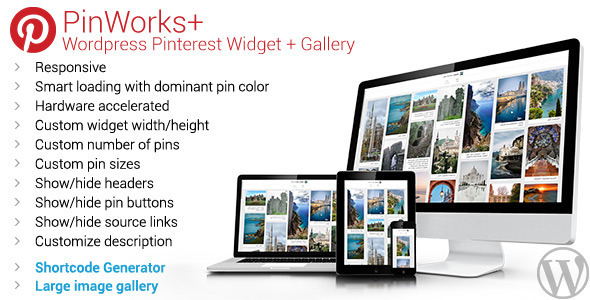 PinWorks+ can also display your pins with a lightbox gallery that loads large images of the pins directly from Pinterest. Not even Pinterest website does have a feature like this. This way, your pin collection becomes an instant photo gallery. Images can be viewed with transitions and with captions. Because it uses the api, results are obtained instantly (no web scraping). The plugin panel in the text editor allows inserting shortcodes into posts and pages with your specific references. The plugin allows multiple customizations over the pins being shown: fixed or responsive(100%) width for the pin container, custom height, custom pin sizes, custom number of pins (max of 50), showing/hiding “Pin it” button, showing/hiding Pin’s source link, showing/hiding/trimming description. PinWorks+ is also designed for bandwidth efficiency. Only the pins that you look upon will have their images loaded. For a nice effect, each pin shows a dominant background color of the image, before the image is loaded. Shortcode Generator allows setting your Pinterest widget very fast. Insert your generated shortcode into posts and pages. Everything is ready in a second.